The Panthers have agreed to terms with goaltender Michael Hutchinson on a one-year, one-way contract. SUNRISE, Fla. – Florida Panthers President of Hockey Operations & General Manager Dale Tallon announced today that the Panthers have agreed to terms with goaltender Michael Hutchinson on a one-year, one-way contract. Hutchinson, 28, split the season between the Winnipeg Jets and their American Hockey League affiliate, the Manitoba Moose. The 6-foot-3, 202-pound native of Barrie, Ontario, appeared in three games with Winnipeg, owning a 2-1-0 record, 3.26 goals against average and .907 save percentage. With Manitoba, Hutchinson made 26 appearances, registering a 17-5-4 record and two shutouts. His .935 save percentage and 2.08 goals against average ranked him second and third in the AHL, respectively. Hutchinson played in the 2018 AHL All-Star Game and was named to the 2017-18 AHL Second All-Star Team. He has played in 102 career NHL games with Winnipeg, posting a 43-39-11 record, 2.65 goals against average, .910 save percentage and three shutouts. 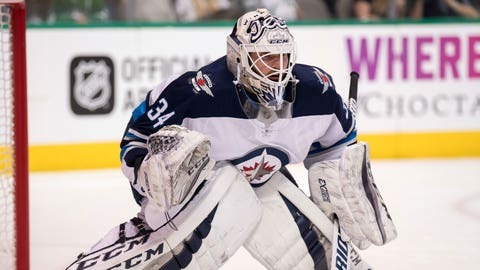 In the 2014-15 season, helped the Jets make their first Stanley Cup appearance since moving to Winnipeg in 2011-12, by producing a career-best 21-10-5 record, 2.38 goals against average, .914 save percentage and two shutouts. Over Hutchinson’s career in the AHL, he has appeared in 137 games with Manitoba, St. John’s and Providence, registering a 73-47-4 record, 2.42 goals against average, .921 save percentage and 12 shutouts. In the 2014 Calder Cup playoffs, Hutchinson helped lead St. John’s to the Calder Cup Finals with a 12-9 record, 1.95 goals against average, .938 save percentage and three shutouts. For his postseason performance, Hutchinson was awarded the Jack A. Butterfield Trophy as the most valuable player of the AHL playoffs. Hutchinson was originally selected by the Boston Bruins in the third round (77th overall) of the 2008 NHL Draft.